“The Ultimate Leader ship and Unparalleled leadership of Muhammad(SAWS) final part"
Next year Prophet (SAW) planned for performing Hajj with his whole family. 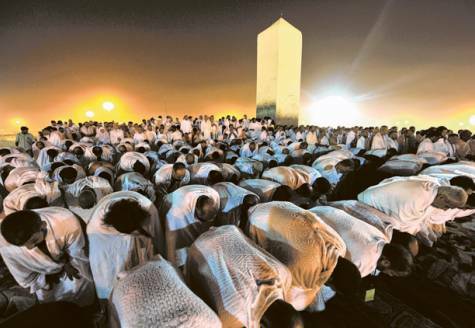 Whole of Arabian Peninsula has embraced Islam now. His Last sermon is the summary of his teachings and commands from Allah (swt). It is a by- laws for Islamic jurisprudence. 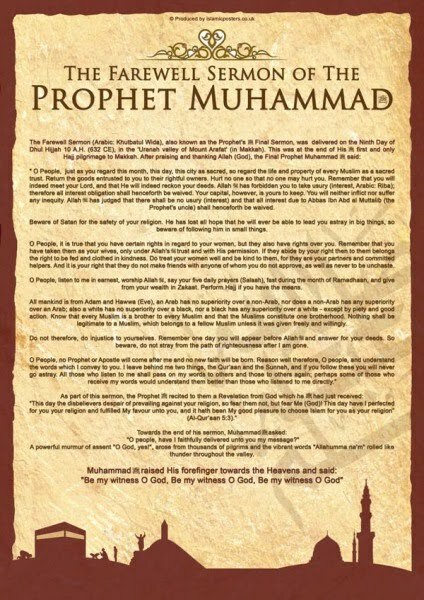 Prophet(SAW) emphasized all the rights over each other. "O Men, listen well to my words, for I do not know whether I shall meet you again on such an occasion in the future. O Men, your lives and your property are sacred for each other as on this holy day and holy month. Remember that you will indeed meet your Lord, and that He will indeed reckon your deeds. Thus I warn you. Whoever of you is keeping a trust of someone else shall return that trust to its rightful owner. All interest obligations shall henceforth be waived. Your capital, however, is yours to keep. You will neither inflict nor suffer inequity. Allah has judged that there shall be no interest and that all the interest due to `Abbas ibn `Abd al Muttalib shall henceforth be waived. Every right arising out of homicide in pre-Islamic days is henceforth waived. And the first such right that I waive is that arising from the murder of Rabi'ah ibn al Harith ibn `Abd al Muttalib. It is your right that they not fraternize with any one of whom you do not approve, as well as never to commit adultery. But if they do, then God has permitted you to isolate them within their homes and to chastise them without cruelty. But if they abide by your right, then to them belongs the right to be fed and clothed in kindness. Do treat your women well and be kind to them, for they are your partners and committed helpers. Remember that you have taken them as your wives and enjoyed their flesh only under God's trust and with His permission. Reason well, therefore, O Men, and ponder my words which I now convey to you. I am leaving you with the Book of God and the Sunnah of His Prophet. If you follow them, you will never go astray. O Men, Listen well to my words. Learn that every Muslim is a brother to every Muslim and that the Muslims constitute one brotherhood. Nothing shall be legitimate to a Muslim which belongs to a fellow Muslim unless it was given freely and willingly. Do not, therefore, do injustice to your own selves. O God, have I conveyed Your message?" As the Prophet delivered his speech, Rabi'ah repeated it sentence by sentence and asked the people every now and then whether or not they had understood the Prophet's words and committed them to memory. In order to make sure that the people understood and remembered, the Prophet used to ask his crier to say: "The Prophet of Allah asks, `Do you know which day is this?" The audience would answer, "Today is the day of the greater pilgrimage." The Prophet then would say, "Tell them that Allah has declared inviolate your lives and your property until the day you will meet your Lord; that he has made the safety of your property and of your lives as inviolate as this day." At the end of his speech, the Prophet asked, "O Allah, have I conveyed your message?" And the people answered from all corners, "Indeed so! Allah is witness." When the Prophet finished his sermon, he dismounted and waited until noon, at which time he performed both the noon and the midafternoon prayers. He recited to the people the concluding divine revelation: "Today I have completed for you your religion, and granted you the last of my blessings. Today I have accepted for you Islam as the religion." [Qur'an, 5:4] When Abu Bakr heard this verse he realized that with the completion of the divine message, the Prophet's life was soon to come to a close. Today, if we ponder about the life of Prophet (SAW), we can realize his most amazing personality with greatest leadership qualities in all spheres of life. ISLAM calls for equality between people. Prophet Muhammad (peace be upon him) said: "An Arab has no superiority to a non-Arab and a white man has no superiority to a black one except through piety and good deeds." Bilal complained to the Prophet, who addressed Abu Dharr saying, "Did you call him a name reviling his mother? It appears you still retain vestiges of Jahiliyyah (Period of Ignorance before Islam)." The Prophet also said in reply, "You are his brother (and should be considerate and kind to him)." Another example is when, during the lifetime of the Prophet, a woman of the Bani Makhzoom tribe, Fatimah, was found guilty of theft. She was brought to the Prophet so that she might receive her punishment according to the Shari 'ah (Islamic Law). It was therefore decided after deliberation to send Osamah Bin Zaid for such intercession since he was very much in favour with the Prophet. So he was approached, prompted to intercede and he talked to the Prophet on this issue. The Prophet was very angry and said to Osamah, "You intercede in the matter of the limits prescribed by God?" Then he called a big gathering of the believers and, in a touching manner, said, "The people before you who met their doom, discriminated between the autocrats and the common people in the dispensation of justice for crimes like theft. The high-placed were spared while the weaker sections of society were readily punished. By God, if Fatimah Bint Muhammad had committed theft, I would have amputated her hand also. A third example involves Adi Bin Hatim(one of the elite of his time) who came to Madinah before embracing Islam and found the companions sitting around the Prophet. They had just returned from some battle and some of them still had the armoury and helmets on. 'Adi, witnessing the awe of the Prophet and their reverence for him, himself fell in awe. When 'Adi witnessed this state of affairs, he was very much touched by this inconceivable concept of generosity in action and embraced Islam. 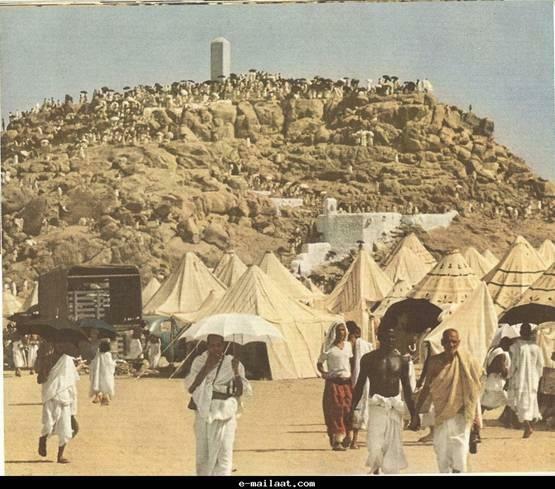 A fourth example was offered when, after 21 years of hard struggle, the Prophet conquered Makkah. Those who had rejected him, had driven him out of his home and had been waging wars with him were brought before him vanquished. But even then, he called them to the Faith and kept in view those lofty principles that he had preached in the vales of Makkah or had enforced in Madinah as a ruler when he was laying the foundations of a new civilization in the Islamic history. Standing at the gate of the Ka'aba he said, "O you people of Quraish! Allah has, this day, put an end to your pride of the Jahiliyyah (Days of Ignorance) and also the pride of your ancestry. Keep in mind! All men are the offspring of Adam, and Adam was fashioned out of clay". The Quraish who held an exalted position in the Arab society, and had a high opinion of themselves, listened to him in silence with bowed heads. On this occasion he recited the following Qur 'anic verse which he had been reciting off and on: "O Mankind! We created you from a single (pair) of a male and a female, and made you into nations and tribes, that you may know each other (not that you may despise each other). Verily, the most honoured of you in the sight of God is (he who is) the most righteous of you." The same rules were followed by the caliphs after Prophet (saw). During the period of the caliphate of Abu Bakr. He set the example of a ruler whose heart was full of sympathy for his subjects without distinction of rank or class. Notwithstanding his position as the head of the Muslim state, he would visit the girls of the locality whose fathers had fallen martyrs in wars. Salallahu taalaa alaa khairi khalqihi Muhammadun wa Alihi wa Ashabihi Ajmaiin.